Career Week kicked off with a panel discussion with employees from Cisco, which was sponsored by the Office of Career Planning and the School of Arts & Humanities. 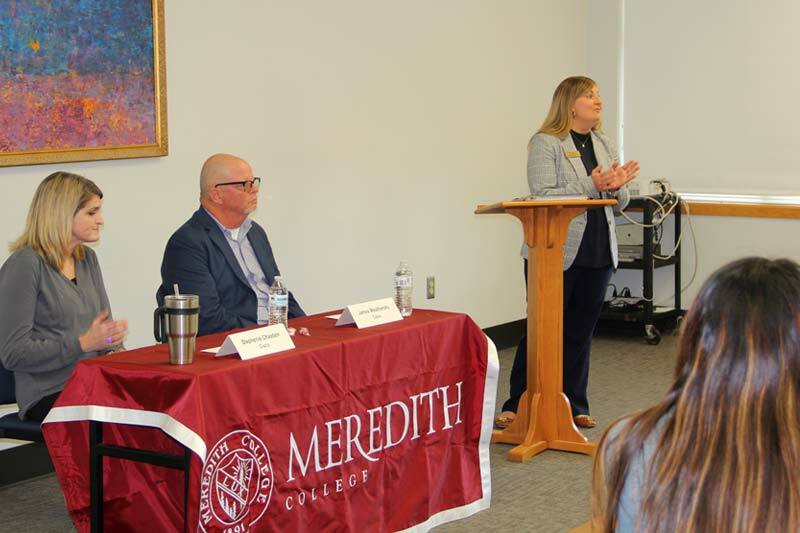 The event, which was held on February 15 in Harris 214, featured guest speakers James Weathersby, director in threat defense technical marketing, and Stephenie Chastain, senior product line manager of cybersecurity analytics and threat intelligence. While Cisco is a technology-based company, the presentation was geared toward all majors to inform students about the importance of developing interpersonal and technical skills that will better prepare them for the job market. The speakers emphasized that there are many non-technical roles at Cisco, especially opportunities in marketing and public relations. “Don’t let a particular degree or lack of a degree stop you from going after a job that you are interested in,” said Chastain. The panelists explained on the core aspects of any degree show that the applicant has skills in communication, adaptability, drive, and a willingness to learn, which are the most necessary skills for any job. The speakers spoke particularly high of adaptability in a job candidate. “There is no straight line for getting things done, so adaptability in the modern workplace is essential,” said Weathersby. The panelists explained that when preparing for a job interview it is important to be poised and confident, even if you have to fake your confidence in the beginning. They also added that it’s very important to have emotional maturity when starting a new job. When talking about emotional maturity the panelists were referring to understanding that sometimes grunt work is part of the job and that one shouldn’t expect too much too fast when they are just starting out. The Cisco panel also touched on the importance of research throughout your career. As a global company, Cisco employees often have the opportunity to travel the world. Because of that, they mentioned the importance of researching the business practices of the area because the practices might be different and you don’t want to risk accidentally offending anyone. “The panel was very insightful about how to handle yourself in a business setting and how to be knowledgeable on various dress codes when conducting business around the world,” said Alexandra Lankenau, ’19. The speakers ended the session by talking about the importance of networking and building a professional network. They advised the audience not to be afraid to connect with people and put yourself out there, because most of the time when a company is looking to hire someone they put it out to other employees that they are hiring for a position before it goes out to the web. The panelists also emphasized the importance of networking within your own company. They recommend using your lunch break to make connections and socialize with your co-workers instead of taking a working lunch at your desk every day, because those connections will be more influential in furthering your career than the extra 30 minutes you put into a project.